Trojan War, in Greek mythology, war between the Greeks and the people of Troy. The strife began after the Trojan prince Paris abducted Helen, wife of Menelaus of Sparta. When Menelaus demanded her return, the Trojans refused. Menelaus then persuaded his brother Agamemnon to lead an army against Troy. At Aulis, troopships gathered, led by the greatest Greek heroes—Achilles, Patroclus, Diomedes, Odysseus, Nestor, and the two warriors named Ajax. In order to win favorable winds for the journey, Agamemnon sacrificed his daughter Iphigenia to Artemis. The winds came and the fleet set sail for Troy. For nine years the Greeks ravaged Troy's surrounding cities and countryside, but the city itself, well fortified and commanded by Hector and other sons of the royal household, held out. 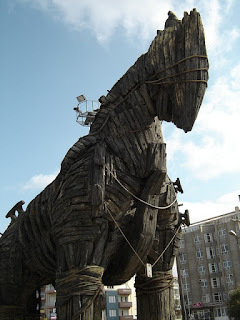 Finally the Greeks built a large hollow wooden horse in which a small group of warriors were concealed. The other Greeks appeared to sail for home, leaving behind only the horse and Sinon, who deceitfully persuaded the Trojans, despite the warnings of Cassandra and Laocoön, to take the horse within the city walls. At night the Greeks returned; their companions crept out of the horse and opened the city gates, and Troy was destroyed. The gods took great interest in the war. Poseidon, Hera, and Athena aided the Greeks, while Aphrodite and Ares favored the Trojans. Zeus and Apollo, although frequently involved in the action of the war, remained impartial. The events of the final year of the war constitute the main part of the Iliad of Homer. The Trojan War probably reflected a real war (c.1200 B.C.) between the invading Greeks and the people of Troas, possibly over control of trade through the Dardanelles. 0 Response to "Short Story of Trojan War"